As a parent, I sometimes feel like I have stale ideas. I usually have the same ideas: take the kids to the zoo, take them out for ice cream, or go on a long bike ride with them. I find it difficult to stretch out and find new things to do. And then a couple of weeks ago I was driving home from work and I noticed quite a few train cars off of the beaten path. I investigated and discovered the Arizona Railway Museum. I knew that I had to take the kids and check it out. The opportunity came. My wife was taking the girls to a birthday party, and my four year old was disappointed that he wasn't going. Then I mentioned to him that we could go check out a train museum with some real engines, and he was like, "Birthday party, schmirthday schmarty." He couldn't wait for Saturday to come. So here's what we discovered: The Arizona Railway Museum is, in the words of Little E, "Totally AWESOME!" Walking around the train yard and through the building is free. That's right. FREE. Walking through the display cars costs $2 per person, or $5 per family. So for $4 Little E and I walked around and through trains for a couple of hours and had a blast. The train yard is filled with dozens of cars. We walked around locomotives, tankers, box cars, cabooses and passenger cars. We walked through dining cars and sleeper cars. Little E got to sit in the driver seat of a steam locomotive and ring the bell. Little E sat on a train bench and watched a video of Arizona trains driving through valleys and around mountains. And the look on his face walking around, under, and through train cars would have been worth ten times the price. 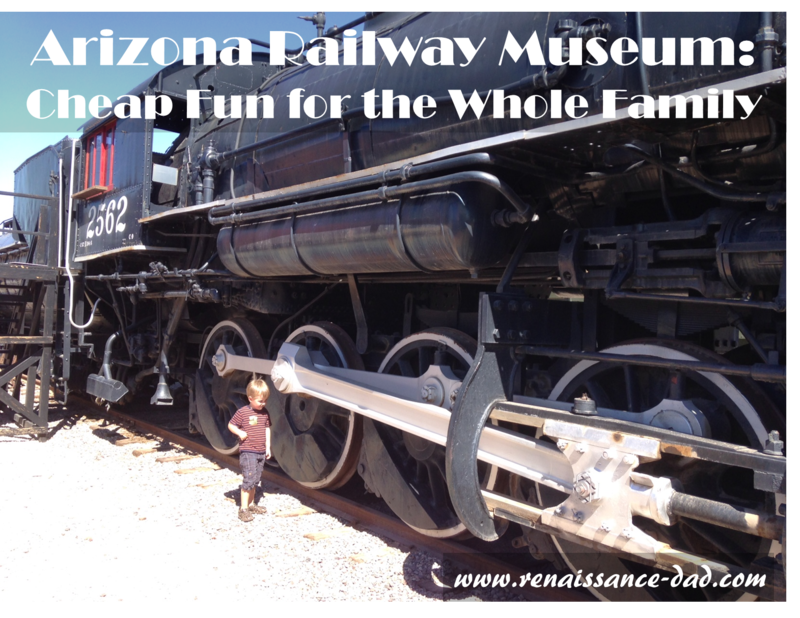 The Arizona Railway Museum has quickly become a Renaissance Dad family favorite, and I highly recommend this hidden gem if you ever find yourself in the Phoenix, Arizona area. This article was written from pure enjoyment of spending time with my son at a really cool place. I received no compensation from the Arizona Railway Museum for this article.